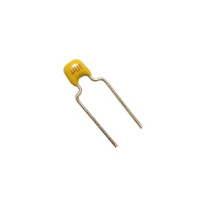 A ceramic capacitor is a fixed value capacitor in which ceramic material acts as the dielectric. It is constructed of two or more alternating layers of ceramic and a metal layer acting as the electrodes. The composition of the ceramic material defines the electrical behavior and therefore applications. Ceramic capacitors are divided into two application classes: Class 1 ceramic capacitors offer high stability and low losses for resonant circuit applications. Class 2 ceramic capacitors offer high volumetric efficiency for buffer, by-pass and coupling applications. Ceramic capacitors, especially the multilayer style (MLCC), are the most produced and used capacitors in electronic equipment that incorporate approximately one trillion pieces (1000 billion pieces) per year. Ceramic capacitors of special shapes and styles are used as capacitors for RFI/EMI suppression, as feed-through capacitors and in larger dimensions as power capacitors for transmitters.